NOTE: Try re-installing donation package from Google Play if not work after update. Now compatible with Android KitKat with ART runtime. 4 experimental features graduate to free version. Everyone's favorite hedgehog returns to his roots in Sonic Advance, featuring all of the original levels from the classic video game. Dr. Eggman has a diabolic plan to launch his Egg Rocket against the world and has created a super-powered robot called Metal Knuckles to make sure a famous hedgehog doesnt get in the way. Utilize Sonics legendary high-speed abilities to scrap Metal Knuckles, defeat Dr. Eggman and save the world! 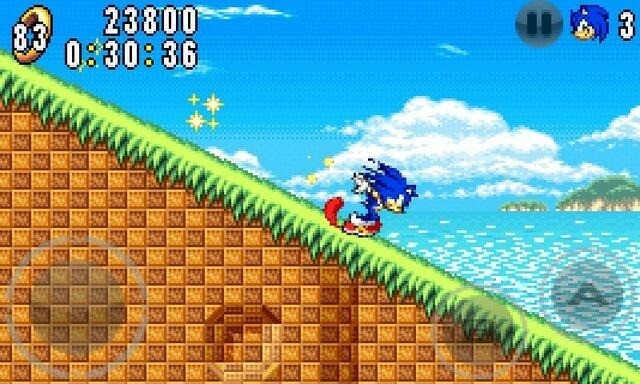 The highest rated Sonic game ever adapted to your mobile. Explore 8 stages divided into 4 worlds: Neo Green Hill, Secret Base, Angel Island & Casino Paradise. Overcome a mini-boss in each world, plus the final boss. A super speed experience! Run, roll & perform special moves like the Aerospin in a flash. Play Story mode to advance through the plot or choose Time Attack to beat levels as fast as you can. ** Custom codec for MX Player 1.7.20 is not compatible with this version. Please install latest custom codec again. My English is not very good, but the Chinese do not problem! 1 - Extract and copy the data "com.square_enix.android_googleplay.dq8j" for Android / obb. Overview: Defeat the forces of darkness and defend Emerland in The Chronicles of Emerland Solitaire. When deciding to learn card magic at an old wizards school, you couldnt have imagined that fate had chosen you as the savior of the world. When Emerland is threatened by the evil sorcerer, Sat, you must unite the races of Elves, Humans, Dwarves and Mermaids. Only together can you challenge him! Overview: This app installs a custom unix/linux like su binary which grants root powers to all apps by default without any fuss and any confirmation. This app installs a custom unix/linux like su binary which grants root powers to all apps by default without any fuss and any confirmation. This app is meant for developers and powerusers who develop rooted apps or use trusted rooted apps. The 'root to all apps' behaviour may be considered 'insecure' by some, if you feel more secure with confirmations, then this app may not be for you. The superuser X su binary essentially cuts off the middle man, i.e. the slow grant dialogues and the dependency on the parent superuser app. This also means that you will have root powers even if the superuser app or installer gets corrupted or uninstalled. This is the Lamborghini among superusers! Once the binary is installed, you can uninstall the app. For some this may be disappointing but the plus side is you can save space and have one app less in the launcher! The traditional su is a command line application, it does not need this fancy UI to run your commands! You can keep the installer if you like. Requires a rooted device. A Complete BusyBox installation is recommended for rooted apps. Install Superuser by ChainsDD / SuperSU by Chainfire / Superuser by ClockworkMod and allow them to install their own su binary. Once that is done, just unistall superuser X the usual way. Just press the red install button. su in command line or yellow #shell button in GUI. This app does not root your phone - it is against Google Play TOS for apps to root a phone. Contact me at maxice@gmail.com for support. - Bugfix for Galaxy S2 and some devices. - Bugfix for the devices with the fullHD screen. - Bugfix about the disorder on point purchase. Overview: Break free from the boundaries Samsung has placed on its multi window feature. Now you can use any app in split screen, not just the few that are natively supported by Samsung or the app developer. I know a lot of custom roms have enabled all apps for multi window by default, but I find this bogs down the launch bar, not to mention it's no fun digging through 2-300 apps to find the ones you actually want to use in split screen. This app makes all apps multi window capable, but only adds the ones you specify to the launch tray. This means you can drag an app from the launch bar onto ANY app and it will launch in split screen...even apps that aren't explicitly selected to be enabled for multi window. - Create a 2-app shortcut allowing you to launch two apps at once in split screen mode. Some phones does not support call recording properly. This is due to capabilities of different chipset/CPU each brand/model have. US USERS: Try workaround in ACR settings with audio input mode set to VOICE_CALL to see if you can get proper 2 way call recording. -Added new rule! Hope it makes you fun. You can enjoy all the contents of this game Free!!! Try to draw everything with only One touch. Over 30 millions players cant be wrong. Top 10 Brain & Puzzle Game in 30 countries. Top 10 free game in 60 countries. The only problem is You cannot draw twice the same line.